We wish to celebrate Nev’s life and acknowlege his enormous contribution to the band as a founder member treasurer and active player for 20 years. Neville was a great raconteur who had masses of facts and stories at his fingertips. His enormous collection of videos, tapes and old movies and book betrayed his interests, particularly in jazz musicians. 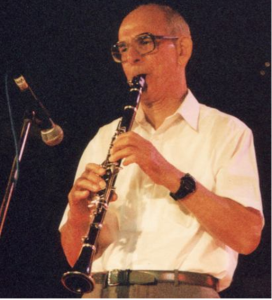 He was able to play all genres of music, but was specially skilled in jazz improvisation. He always wore a cap, and loved them. He was always extremely polite, even when faced with pretenciousness, which he did not suffer. Men had to be men, and women treated with deference as ‘fragile flowers’. I remember the first time I visited Diggles Street, to deliver something. As I approached the house, my progress slowed to the sound of a Benny Goodman classic. I remember thinking that Benny was on top form when the recording was made, and then the solo stopped! After a moment the track restarted and I realised that I was listening to Neville. I sat on the doorstep and heard the track out. Nev was all about helping people. I told him once that I had a student who was struggling with jazz imprvisation. Within a couple of days, he found a bag full of material to help. This was typical of him. He helped many of the band in this way. He was gregarious, and was never lost for words. He was open and honest, both in his dealings with people, and in his duties. He was always the first to volunteer to help out. Above all, he was a loyal and trusted friend. Thank you so very much for letting me know about Neville. I thought about him the other day and was wondering where things were at with him these days. I always have fond memories of playing quintet music at his place, sharing lifts to band in the old days in his little green volvo and once when I asked if I could borrow his lawn mower he came and did it himself using his second model victor lawn mower than he’d had for 50 years and it was still going strong! I’ve though about the logistics but can’t realistically get away from Melbourne although I very much would like to be there. Please pass on my apologies and my greetings to the rest of the band. Someone told me old musicians don’t die, rather their music gradually fades away until you can’t hear it anymore. But I think I will hear Nev’s improvisation echoing in my head for many years to come. I played next to Neville for some years from 2000 on until I left Canberra at he end of 2004. I became very fond of Neville and his sotto voce cynicism. And he was a very good player. We resuscitated him when he collapsed one night which I think was the first clear evidence of his heart disease. I think he thought I had saved his life but I think he had simply “come around” in response to Betty’s CPR. I am playing now with a Sydney band but there is no-one in it like Neville. Please convey my wishes to his family and let them know how well he is remembered and liked.